The couple is gearing up for a weekend of wedding festivities. 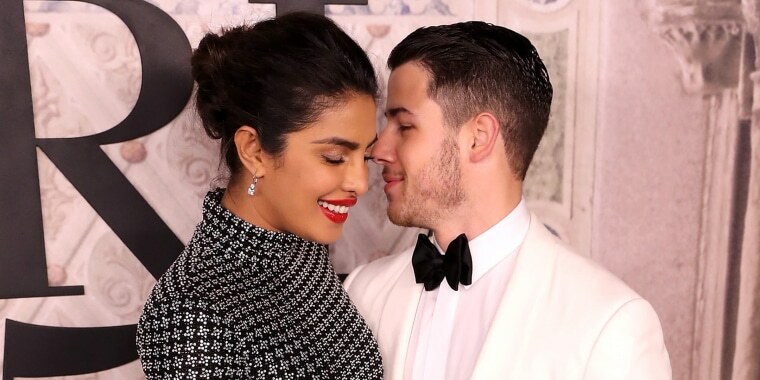 Wedding bells are ringing for Nick Jonas and Priyanka Chopra! The couple kicked off their wedding weekend in Jodhpur, India, alongside both of their families and a crowd of guests. Chopra, 36, and Jonas, 26, who confirmed their engagement in August, shared a joint statement to each of their Instagram followers on Saturday. The photos shared in the post are ones from Chopra's mehendi (or mehndi) ceremony, a celebratory pre-wedding tradition in many South Asian cultures involving the elaborate application of henna on the bride-to-be. There, Chopra wore a beautiful Abu Jani Sandeep Khosla gown while partying with friends and family. If these gorgeous shots are any indication, the multi-day festivities will be filled with laughter, love and luxury. The couple told Vogue that they're marrying at Umaid Bhawan Palace, a pink sandstone-and-marble palace in Rajasthan. They will have two ceremonies — a traditional Indian wedding and a Christian service officiated by Jonas’ pastor father — that will take place in different spaces within the palace. Jonas, Chopra and their families have embraced each other's backgrounds with wide open arms. Chopra told Vogue that, during the pair’s August roka ceremony, a traditional engagement celebration, Jonas led the prayers. As for wedding attire, Ralph Lauren confirmed in a tweet that the couple, along with their wedding party, will wear custom-made Ralph Lauren pieces. Jonas and Chopra wore Ralph Lauren designs on several occasions, including to the 2017 Met Gala. After announcing their engagement, the couple also attended Ralph Lauren's 50th anniversary celebration together during New York Fashion Week in September. Although neither the designer nor the couple have released their wedding outfits, we do know Jonas will dress like "royalty," according to Vogue, wearing a turban, carrying sword and riding in on a horse. “People will need vacations after this wedding,” Chopra told the magazine. Sounds about right.